Suede Brush – Using a suede cleaning brush will remove dirt from suede after wearing and to re-fluff the suede pile. It is recommended that you brush your suede shoes or boots after each wear to reduce build up of grime. Old Toothbrush – If you do not have a suede brush, you can use an old soft toothbrush in a pinch. Be sure it is cleaned and completely dry before use, or you may risk adding water or toothpaste stains to the suede. Corn Starch – For oily stains, it is best to treat the spill as quickly as possible. If you are out, use a napkin or towel to absorb as much of the oil as possible. Then as soon as you are able, generously cover the stain with corn starch. Allow to sit for 10-15 minutes. In this time, the powder should begin absorbing the oil from the suede. 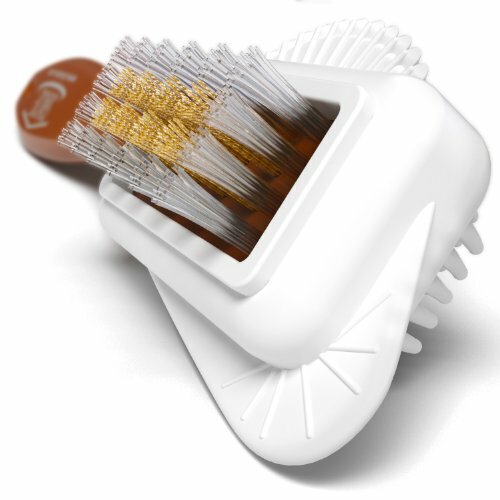 Using a suede brush or clean toothbrush, begin brushing away the corn starch. Repeat if necessary. 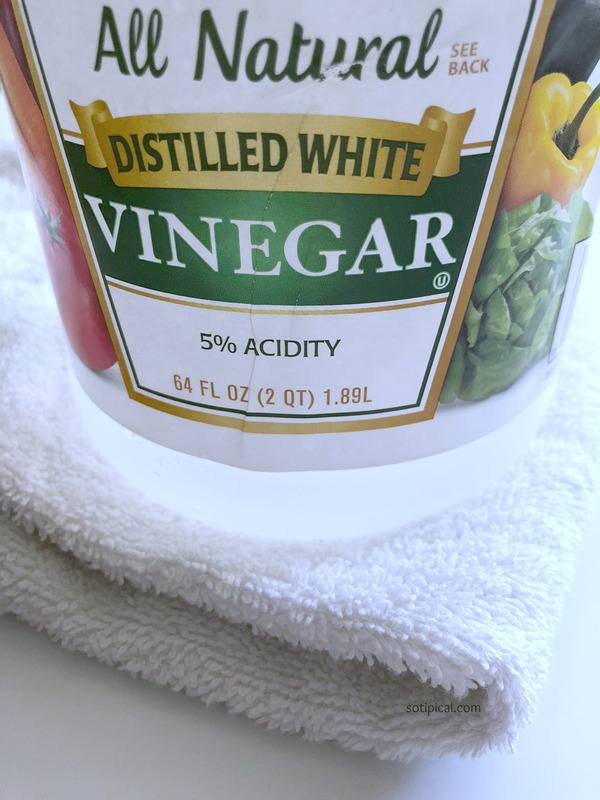 White Vinegar & Soft Cloth – If your stain still persists, you can try this next step! After the powder is completely brushed away, take a soft WHITE cloth (to avoid transferring color to your suede) and add a bit of white vinegar. Be careful not to saturate the cloth. Just a little will do and you can add more, as needed. Gently rub the stained area to remove the stain. Rubbing Alcohol – You may substitute rubbing alcohol for white vinegar. Use a clean white cloth and gently wipe away the dirt. 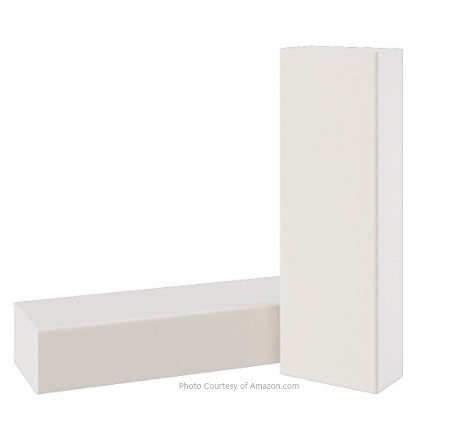 Suede Eraser – I also have a cleaning kit which includes a suede brush and eraser. Not only does the eraser remove grime from the outside of the suede shoes or boots, but its also good for cleaning suede insoles. A pencil eraser can be used as well. I prefer white erasers because there is always the risk of transferring some of the orange eraser on lighter shades of suede. Here is a very quick example of how the eraser works on removing dirt from suede. I didn’t spend a lot of time working on this shoe, but you can see the progress made in just a few minutes! 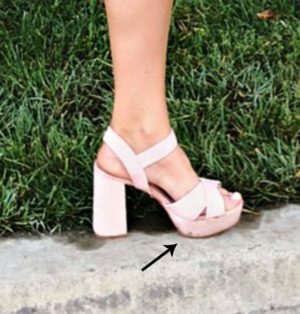 Baby Wipes – My daughter wore baby pink Nubuck suede shoes for Homecoming. While taking pictures, we quickly discovered that the grass was wet and muddy! I wish I had a good picture that showed the mud splatter on her shoes, but when I tried to zoom in, it just became blurry. The other shoe had even more mud, but I don’t have a photo of it. One of the moms there suggested that we let it dry a bit, then use baby wipes to remove the mud and IT WORKED! I couldn’t believe it. 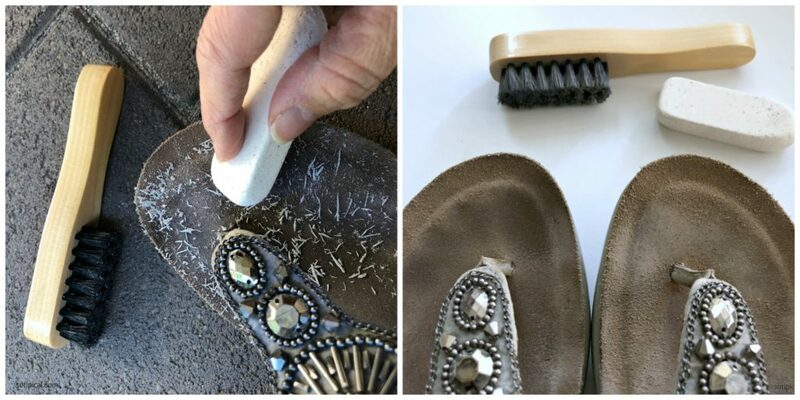 Emery Board/Nail File – Sometimes using an emery board will remove a stain on your suede shoes or boots. It will work like sandpaper and wear the stain away, however you MUST be GENTLE when rubbing it out. Rubbing to hard may damage the material. This method can be effective when removing adhesive or a sticky substance from suede. 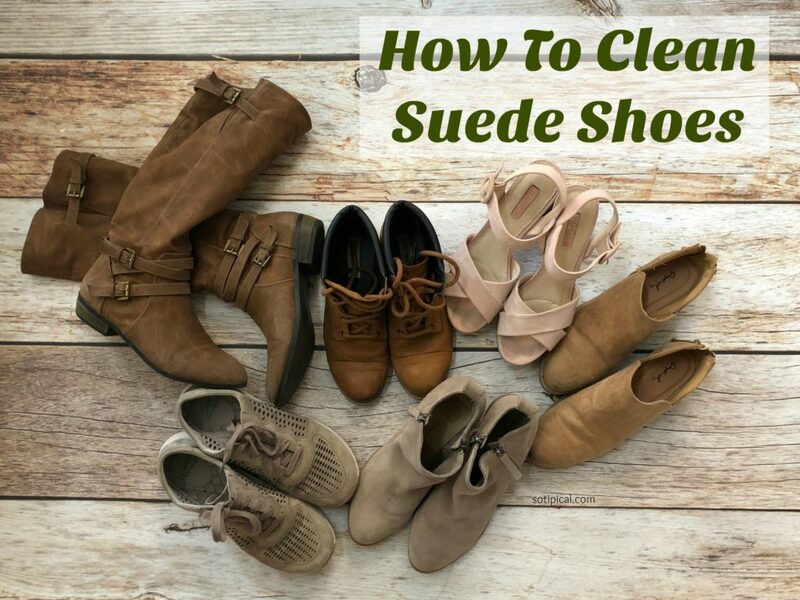 I’m sure there are other methods for cleaning suede shoes out there, but these are the ones I have either tried or know someone that has tried successfully. If you have had any success with other methods, please let me know in the comments!